As reported by The Korea Joongang Daily, Samsung's operating profit plunged during the third quarter of this year, primarily due to decling sales of its smartphones. The accompanying graphic (click for a full-size version) shows the overall picture. The article noted that, "According to Samsung yesterday, its IT and mobile communications business performance plunged in the third quarter as its revenue from smartphones shrank 32.8 percent year-on-year and was 13.6 percent less than in the second quarter. Samsung Electronics’ operating profit for its IT and mobile communications business dropped nearly 74 percent year-on-year and also declined 60 percent from the previous quarter." 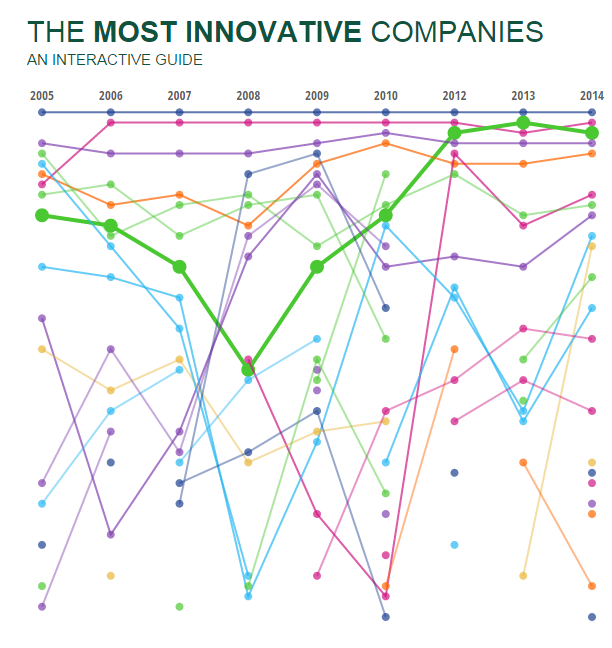 The Boston Consulting Group (BCG) has released its annual ranking of the world's fifty most innovative companies, based on a survey of more than 1,500 senior executives in a wide range of countries and industries. In the latest survey, tech and telecom firms led the ratings. As shown in the accompanying graphic, captured from the BCG's online interactive guide, Apple (the blue line) has led the rankings every year since 2005, and Google (in dark pink/red) has been number two or three every year since 2006. Although innovation can be a somewhat slippery concept and this is only a survey of executive perceptions of it, what struck me about the study was the pattern shown for Samsung (the bold green line). The surveys asked about the Samsung group and were not limited to Samsung Electronics. Nevertheless, the steep drop in its ranking in 2008 coincided with the first full year of worldwide sales of the iPhone, introduced by Apple in 2007. The iPhone was a disruptive technology that no doubt helped explain Apple's number one rank over the years of this survey. Also, Samsung's rise in the rankings coincided with its introduction of Android mobile devices, beginning in 2009. Interesting, if anecdotal, patterns! Earlier this week, on the opening day of the ITU Plenipotentiary in Busan, I sat in my office at SUNY Korea, here in the Songdo Global University Campus and watched the live internet feed of President Park Geun-hye's address at the opening ceremony. The video included with this post summarizes a few of the points President Park emphasized, but the full text of her speech, and a video with simultaneous translation are available at this link. The following excerpts from the ITU's English translation of her speech are also important. She noted that "Telecommunications and ICT has been catalytic in the rapid development of the Internet and mobile communications. This brought about great changes and made it possible to share knowledge in all areas of human lives including politics, economy, society and culture. More recently, with the Internet of Things, interconnectedness, and Big Data analytics are precipitating the convergence of technology and industries. We, thus, have reached an inflection point in the hyper-connected digital revolution – a revolution defined by 'increased connection, smarter connection, and faster connection.'" Later, the President referred to technical and policy challenges, stating that "The rapid growth and diffusion of telecommunications and ICT and the creation of diverse ecosystems will make it necessary to mediate the different interests of multiple parties in order to develop technological standards and international rules that govern order in cyberspace. In order to address this challenge, governments must forge stronger partnerships with the private sector and build a more open and flexible framework for decision-making." Then, with reference to the digital divide, which she referred to as the ICT gap, she said "I propose that the international community commit itself to narrow this global ICT gap so that telecommunications and ICT can serve to improve human rights and welfare for all mankind, irrespective of region, country, gender or class." After noting Korea's low level of telephone penetration in 1980, she suggested that "To lead the hyper-connected digital revolution, Korea plans to build a nation-wide Giga Internet Network by 2017. We also are focusing on technological development and infrastructure upgrade with the aim of being the first country to launch commercial 5th generation mobile communication services in 2020. The high-speed network is the basis for pursuing our Creative Economy strategy, which aims to transform our economic paradigm from being a fast follower to a first mover. The hyper-connected digital revolution is in essence the convergence of and innovation in industry, technology and culture through ICT. The driver of such convergence and innovation is the imagination and creativity of individual people. The Creative Economy is an economy where the imagination and creativity of individuals are fully leveraged to drive convergence and innovation and to create new added value as well as jobs." President Park also stressed that "Korea is ready to share its experience of growth through ICT. I believe Korea's experience in building its broadband network, e-government, and Creative Economy will provide useful references in formulating national ICT policies." President Park Geun-hye elaborates on Korean unification at the U.N.
Last month President Park Geun-hye addressed the United Nations General Assembly meeting in New York. While addressing a number of regional and international issues, the speech elaborated on her vision for Korean reunification, a frequent topic of this blog over recent years (for example, see these posts). Her address, as published by UN Web TV, can be viewed below. 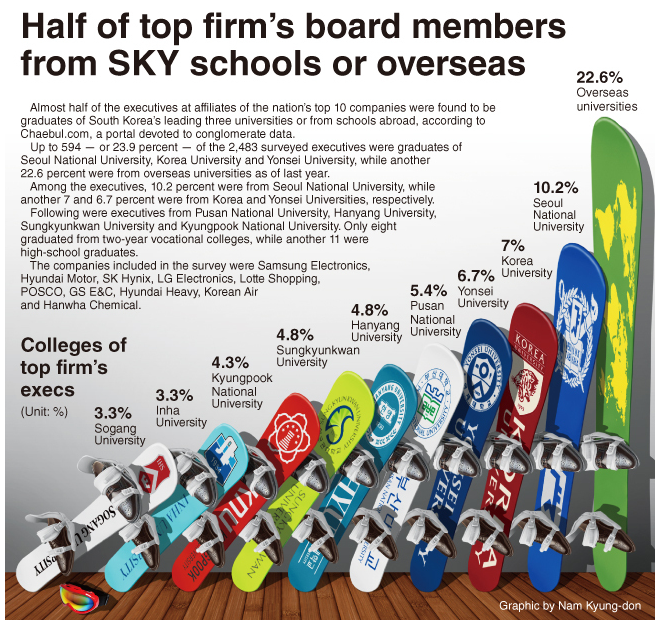 An infographic published by The Korea Herald caught my eye this morning, headlined "Half of major firm's board members come from SKY, overseas schools." 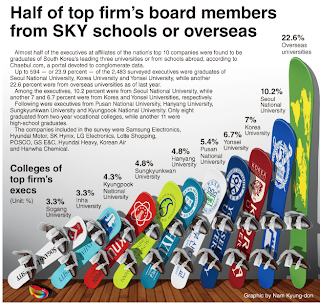 The text accompanying the graphic noted that "Almost half of the executives at affiliates of the nation’s top 10 companies were found to be graduates of South Korea’s leading three universities or from schools abroad, according to Chaebul.com, a website devoted to conglomerate data. Up to 594 ― or 23.9 percent ― of the 2,483 surveyed executives were graduates of Seoul National University, Korea University and Yonsei University, while another 22.6 percent were from overseas universities as of last year." Although anecdotal, this is further evidence that Korea, unlike Japan, embraced study abroad to train many of its leaders and technocrats in recent decades. Indeed, it would be interesting to make a quantitative comparison with Japan on this dimension of corporate leadership. How does this relate to ICT sector issues? As Feffer and Pastreich argue, one of the more urgent problems facing Northeast Asia and indeed threatening its future, is climate change. There is growing awareness all around the world that information and communication technologies will be an important part of the solution to climate change. There is a flurry of press coverage in Korea these days about a so-called "digital migration" from Kakao Talk to foreign messenger apps. As reported by The Korea Times,"Although KakaoTalk is the most popular mobile messenger in the country, a number of Korean users have migrated to foreign mobile messenger services such as Telegram after the prosecution threatened to start real-time monitoring of social media to crack down on libelous rumors shortly after President Park Geun-hye denounced such accusations as baseless." As reported in The Korea Joongang Daily,"On Sept. 18, the Supreme Prosecutors’ Office established a new cyber investigation team, according to the office of New Politics Alliance for Democracy Rep. Chang Byoung-wan, who is also a member of the Science, ICT, Future Planning, Broadcasting and Communications Committee of the National Assembly. The purpose is to prevent cyber defamation and the spread of false information.The idea sparked controversy and it later transpired that the chat records of the deputy head of the left-wing Labor Party, Jeong Jin-u, had been tapped by the authorities using a warrant. That spooked people across Korea. Telegram, which was ranked around 100th on Apple’s App Store in terms of downloads in Korea until last month, was brought up to the top of the list Sept. 24." The Representative's office released the accompanying graphic (click to see a full size version) showing the increased downloads in Korea of the Germany-based app Telegram. These developments in Korea mirror similar concern in other countries around the globe as the question of how to balance free flow of information with personal privacy comes to the fore. Earlier this week while introducing some bright, undergraduate students to the NetIndex explorer on Ookla's website (the subject of this earlier post) I had occasion to ask them the following question. Why does the big difference between Korea or Japan and many African nations (e.g. Korea 54 Mbps, Tanzania 4.2 Mbps) in average internet download speed matter? Put otherwise, why is the difference important? The discussion that followed, along with several alerts that arrived in my e-mail this morning, prompted this post. The McKinsey Group, using World Bank Data, recently published a blog post and a longer white paper entitled Offline and falling behind: Barriers to Internet adoption. The study suggests that there are four categories of consumer-facing barriers to Internet adoption, grouped as 1) incentives, 2)low incomes and affordability, 3)user capacity and 4)infrastructure. On the important topic of network infrastructure, this is one of the first studies I've seen that explicitly acknowledges the important relationship between fixed and mobile networks. 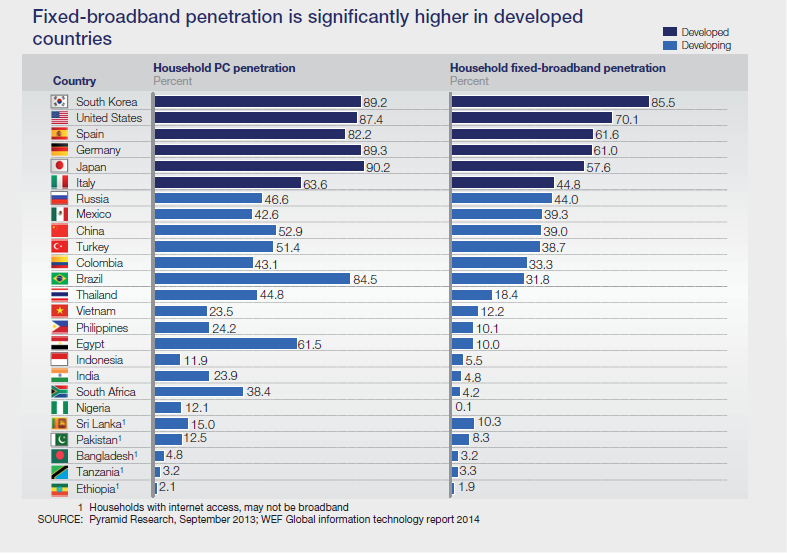 As shown in an exhibit from the study (click to see a full-sized version of the graphic above) fixed broadband penetration is significantly higher in developed nations than in the developing ones. Measured by household penetration, South Korea leads the world, and by a considerable margin over my home country, the U.S.A.
Another graph (click for larger version) from the study shows clearly that a majority of people in the world still do not have access to 3G or faster mobile networks that allow efficient access and use of many bandwidth-intensive internet services. 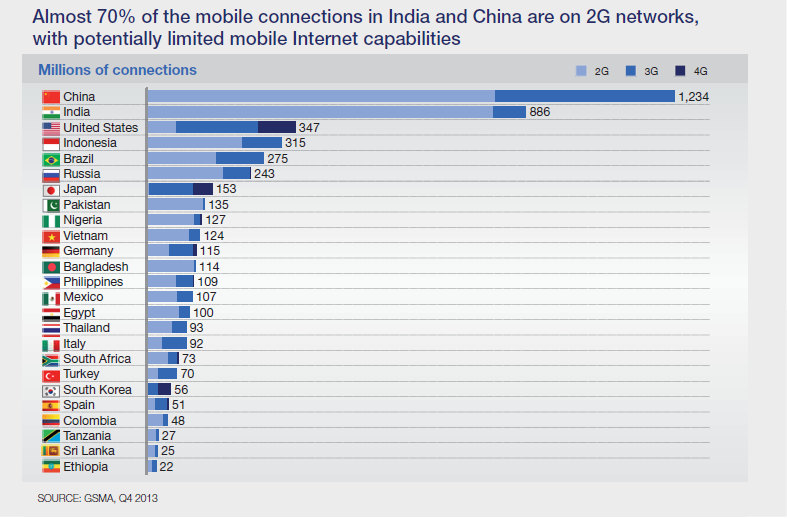 A full 70 percent of the mobile connections in the world's two most populous nations, China and India, are on 2G networks. Of course, this situation will change as developing nations build faster mobile broadband infrastructures. However, the problem is actually more complex than that. Fast mobile broadband networks cannot be built with mobile technologies alone for technical and physical reasons. The electromagnetic spectrum is a finite physical resource, which contains only a small fraction of the bandwidth provided by fiber optic cable. Fixed fiber optic networks interconnect with mobile ones and complement them by providing back-haul service. Indeed, Korea's experience would suggest that developing nations have little choice but to address the longer-term, more expensive project of extending fiber optic networks to the people, alongside their efforts to extend mobile networks.